A friendly, community choir who meet weekly to enjoy singing together. 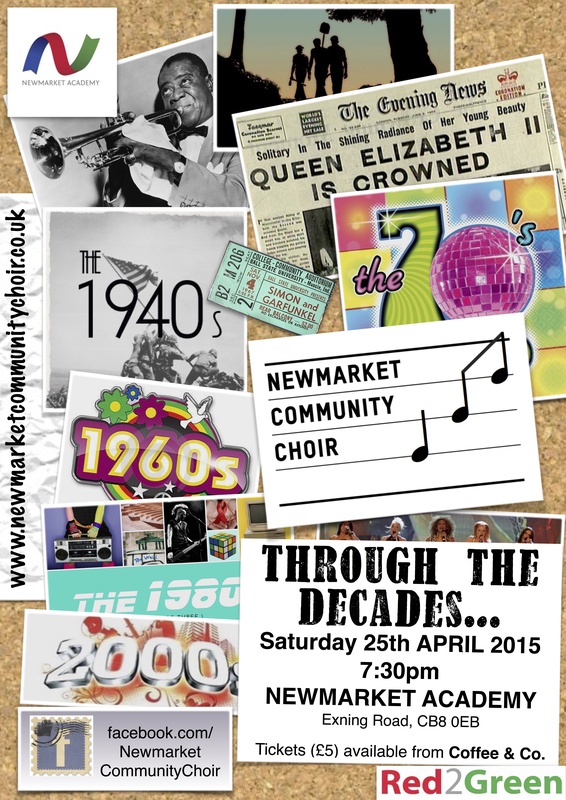 On Saturday 25th April, Newmarket Community Choir will take you on a musical journey through the decades. Whilst we could have found some music based on the early notation methods of Guido d’Arrezo from 1026, we thought it might be easier to start 900 years later, in the 1920’s. Covering almost 1000 years of music would also make for a much longer performance! We’ll be singing some popular favorites from the 1920’s right up to present day. The Newmarket Community Choir are proud to be supporting Red2Green; all proceeds from the concert will be put towards some musical equipment for the charity. This entry was posted in Charity, Performances, Red2Green.